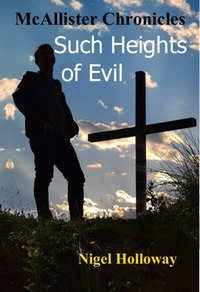 Such Heights Of Evil is the third novel in the McAllister Chronicles. If you haven’t read Second Death, and its sequel, Hamish redux (or even if you have), and you don’t want any clues as to what happens next, don’t read any further…. After being dragged back to the real world, forced to assist in the creation of a clone army, then help a rogue priest in his quest to save the Christian religion from annihilation, Hamish is finally free from the forces that were determined to control his destiny. But despite the outlawing of the invincible clone army by the United Nations, its creator is determined to carry on with his plans for religious genocide. What price will Hamish have to pay to stop him?